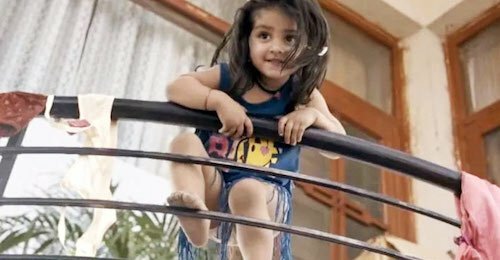 Pihu, a film about a two-year-old girl tottering about unsupervised in a high-rise apartment, appears to have been made specifically with the intention of traumatising the viewer. This is no cutesy Home Alone-style comedy; this is a horror film. Writer-director Vinod Kapri turns an empty flat into a potential minefield. Everyday appliances like a steam iron, a faucet, a microwave, and a cooking range represent life-threatening risks as the toddler in question – alone, frightened, bored, hungry, confused – crawls around desperately, turning knobs, pushing switches, and dropping things, oblivious to the possible consequences. Over the course of 93 minutes, the child is repeatedly put in harm’s way, and you spend the bulk of the film hoping she comes away unharmed. When she climbs the railing of the balcony, her doll dangling over the edge, your heart is in your mouth. It’s easy to draw parallels between Pihu and last year’s Trapped, in which Rajkummar Rao struggled to find ingenious ways to break out of a locked flat. But while that character’s brushes with near-death, his fight for survival might be viewed as thrilling, the same comes off as unmistakably exploitative in the case of an innocent, helpless child. It’s also a shame that the scenarios quickly become repetitive because the script runs out of ideas early on. Perhaps the only reason you stay with the film until the end is little Myra Vishwakarma in the role of Pihu, who doesn’t betray a hint of self-consciousness in front of the camera. It would be a stretch to call it a performance, but Myra’s natural delivery and responses to situations keep you invested even when the film doesn’t. But the movie doesn’t ultimately work because there’s no point to it. It’s neither a compelling cautionary tale about bad parenting or a sufficiently responsible thriller. The film revels in making you flinch and squirm and cringe. That’s just mean-spirited. I’m going with two out of five.